'The director skilfully blends the unreliable hearsay and inescapable paranoia of life constantly under threat by modern warfare with similar feelings precipitated by the Persian folktales and mythology which permeate the story'. Comparisons between Babak Anvari's Under The Shadow and 2014's The Babadook are apt in a number of ways. Both have emerged from somewhere other than Hollywood, both focus on the troubled relationship between a mother and a child, and both prove that it's possible to create an effective and well-made horror film using the tried and tested tropes of the genre in new and interesting ways. Anvari, in his feature debut as both writer and director, in fact presents a traditional haunted house narrative as seen in many other horror offerings past and present. The fact that his chosen format is well-worn, however, doesn't stop Anvari from breathing new life into it, something which he achieves pleasingly on a regular basis. 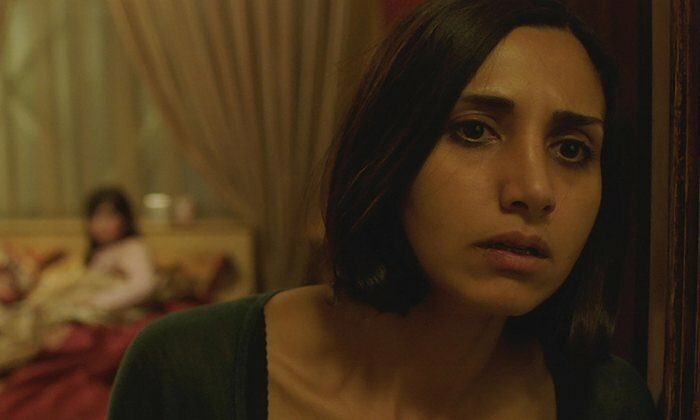 Where Under The Shadow is at its relative weakest is when the director leans most heavily on less inspired mainstream techniques. There are a few jump scares à la James Wan which feel somewhat out of place here; whilst suggesting Anvari could comfortably move on to generic Hollywood fare in the future should he so desire, at the moment everything else here tells us he's better than that. Narges Rashidi and Avin Manshadi in the central roles of mother and daughter beset by the supernatural goings on provide a solid pairing for Anvari to build his film around. Beginning the story surrounded by both husband and father Iraj (Bobby Naderi) and a host of supportive neighbours, the film becomes ever more intense as one by one the other inhabitants of the apartment block exit both the building and the narrative, leaving Shideh (Rashidi) alone to protect young Dorsa (Manshadi) as best she can. The tension between the two is increasingly palpable, with Anvadi skilfully keeping matters ambiguous as to how much of their fraught relationship is down to unearthly forces and how much is simply lack of empathy between Shideh and Dorsa. Elevating Under The Shadow most of all is Anvari's superb amalgamation of the effective horror story he creates with his chosen historical backdrop. Setting his film in 1980s Iran during the country's protracted conflict with Iraq, the director skilfully blends the unreliable hearsay and inescapable paranoia of life constantly under threat by modern warfare with similar feelings precipitated by the Persian folktales and mythology which permeate the story. Anvari deftly parallels the oppressive nature of both the malevolent force tormenting Shideh and the strict fundamentalist society in which she lives, giving his effective yet archetypal ghost story a unique and compelling twist.